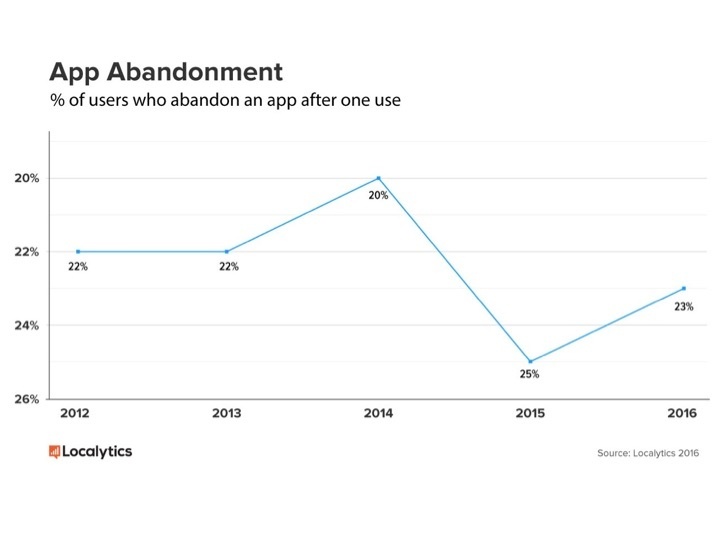 Earlier this week, TechCrunch reporter Sarah Perez published a story, “Nearly 1 in 4 People Abandon Mobile Apps After Only One Use.” The article cites recent data from a Locaytics study that proves that while Apple’s iTunes App Store hosts over 1.5 million apps and Google Play hosts over 2 million apps, the number of apps consumers are downloading and using remains small. The barriers to installation are driving some companies to make it easier than ever for mobile users to download apps. Google recently debuted “Instant Apps” at its I/O event, and the market is watching to see how Apple might answer that announcement. But while the article seemed to show bad news for B2C apps, we’re seeing opposite trends in many of our low-code B2B and B2E apps. Our customers, such as Hayat Communications and a major oil drilling company, report wide adaption and use of their B2E apps, because they have become an integral part of their end users’ daily routine. We recently blogged on key complaints that end users cite when using business apps. By understanding common complaints and thinking ahead to what critical features end users want in their apps, developers can build apps that won’t get abandoned after the first download. Click to read what complaints and 10 most critical features business users cite in end-user surveys. To learn which 7 capabilities your mobile app development platform must include to satisfy end users, click here. To read the full TechCrunch article, click here. To read the full Localytics Research Report, click here. Amy Groden-Morrison has served more than 15 years in marketing communications leadership roles at companies such as TIBCO Software, RSA Security and Ziff-Davis. Most recently she was responsible for developing marketing programs that helped achieve 30%+ annual growth rate for analytics products at a $1Bil, NASDAQ-listed business integration Software Company. Her past accomplishments include establishing the first co-branded technology program with CNN, launching an events company on the NYSE, rebranding a NASDAQ-listed company amid a crisis, and positioning and marketing a Boston-area startup for successful acquisition. Amy currently serves as a Healthbox Accelerator Program Mentor, Marketing Committee Lead for the MIT Enterprise Forum of Cambridge Launch Smart Clinics, and on the organizing team for Boston TechJam. She holds an MBA from Northeastern University.